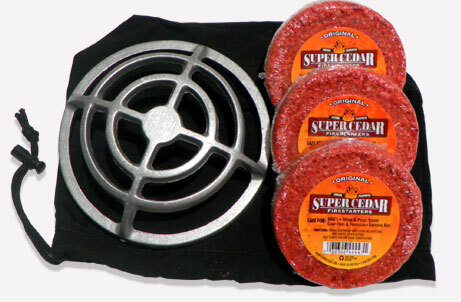 Super Cedar Firestarters are a 4" x 1" disk made from cedar sawdust and highly refined wax. They leave no residues or toxic chemicals behind. Simply light the edge with a match and each starter will burn for 20-30 minutes. One starter can be broken apart to start multiple fires! 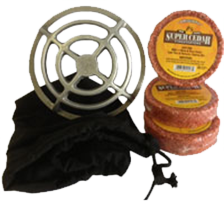 Outdoor Cooking & Survival Kits! Better Than Kindling! So Easy to Use- Safe & Clean. Super Cedar Firestarters even burn when soaked in water! 20-30 minute Burn Time with 12" Flame - Super Cedars can be broken into multiple parts when smaller fires are desired. For those of you with catalytic wood burning stoves, have no fear, the Super Cedar is completely safe for your stove. Ordering is easy and all prices include shipping. Click your area to view your ordering options. Alaska, Hawaii, and Canada have additional shipping costs and require special packaging. Because of the shipping costs and packaging requirements we only offer select products for sale in AK, HI, and Canada. Contact us for additional assistance. Go anywhere with our cast aluminum stove because it weighs less than 1/2 lb. Great for emergencies, for camping, and hiking! Boils soup can size water in under 7 minutes. Heat up foods while hiking, car camping, snowmobiling, sking, emergency power outages. Stand alone relax-a-fire! Each Super Cedar fuel disk may be broken into quarters for smaller heat source. 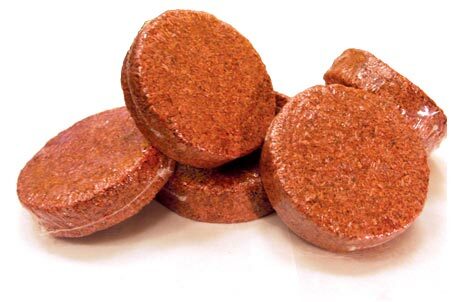 Do not use in 1200 degrees or above environments such as a fireplace, BBQ, grill, or woodstove. This stove is for use with the Super Cedar fuel disk only! May cause damage to stove if too hot!! Ordering is easy and all prices include shipping. Alaska, Hawaii, and Canada have additional shipping costs and require special packaging. Because of the shipping costs and packaging requirements we only offer select products for sale in AK, HI, and Canada. Contact us for additional assistance.